NEW YORK CITY — Summer camp doesn't have to cost a fortune. While some city parents shell out $5,000 or more to give their children a place to swim and play during the summer, there are still plenty of more affordable camp options all across the five boroughs. At Camp Henry on the Lower East Side, youngsters go on field trips, hop in a pool and explore music, drama and crafts — all for just $1,150 for a six-week session. The day camp, run by the Henry Street Settlement, is a bargain compared to the city's pricier summer programs, but kids still get a full complement of activities, including such options as last year's "All About Culture" theme week, when campers traveled through the camp's gym learning about foreign cultures and getting homemade passports stamped. "It's very action packed. They're always doing stuff," said Katha Cato, director of after-school and camp services at Henry Street Settlement. "Really, my gift to the parents is that children go home happy and exhausted at the end of the day." Penny-pinching parents can also look to the YMCA, public schools, the city's parks and neighborhood nonprofits to find free and inexpensive summer programs — but that doesn't mean you have to cross pricey camps off the list altogether. "If your kids have their heart set on a particular camp, always inquire about financial aid," the family blog Mommy Poppins advised. "Many programs offers assistance to families who qualify." 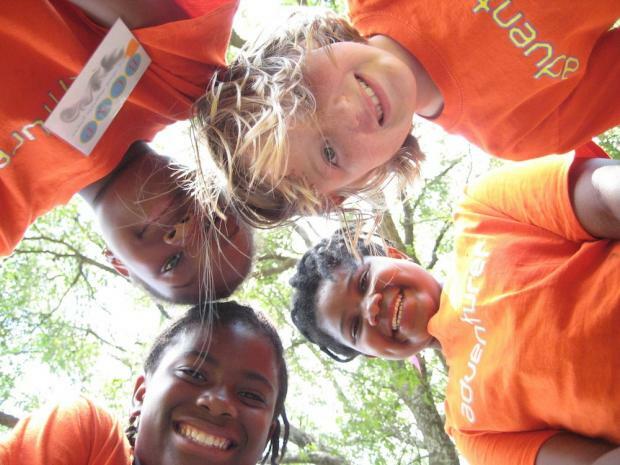 Some camps offer scholarships, payment plans, sliding fee scales or discounts for siblings. And talk to your school — some PTAs, like the one at P.S. 321 in Park Slope, raise money during the school year to help send needy students to summer camp. One of the cheapest options is available through the NYC Parks Experience Summer Day Camp program, which operates day camps in all five boroughs that cost just $500 for seven weeks (July 8 to Aug. 23). Camps run from 9 a.m. to 5 p.m., but at some sites parents can pay extra for campers to stay from 8 a.m. to 6 p.m. Online registration starts March 7. Another low-cost citywide option is the YMCA, which runs summer camps at branches in all five boroughs and offers financial aid and early bird discounts. Fees and programs vary, and some YMCA camps have a special focus, like Chinatown's Mandarin immersion program, a circus arts program in Greenwich Village, Bedford-Stuyvesant's dance program and a camp for children with special needs in Park Slope. Completely free summer camps are available citywide through the Sports & Arts in Schools Foundation, which runs half-day and full-day programs at schools. Some have a sports focus, and some are academic. In addition to Camp Henry, the Lower East Side's Henry Street Settlement runs a day camp at the Abrons Arts Center that immerses campers in visual arts, music, theater and dance. Instruction is overseen by Robert La Fosse, a former principal dancer with the American Ballet Theatre. The camp is popular with families with multiple children because it offers a discount for siblings, director Jay Wegman said. At the end of the summer, campers show off their accomplishments in an art gallery and with a music and dance show that they write and produce themselves — with impressive results, Wegman said. "I have to say, I'm pretty surprised at how sophisticated these shows get," he said. Price: Goddard runs three camps: a free summer day camp for ages 11 to 13 at 154 W. 93rd St.; a camp at the Bernie Wohl Center for ages 6 to 10 that costs $800 for July 1 to Aug. 15; and a West 84th Street camp for ages 5 to 12 runs from July 1 to Aug. 16 and costs $850. At Goddard Riverside's Bernie Wohl Center camp, children do art, music, storytelling, photography and swimming, with field trips about once a week. The camp at West 84th Street offers a similar lineup of activities, plus gardening, hip-hop dancing and ceramics. Campers can also get academic tutoring at the Star Learning Center. "The goal is that children can have a fun enriching and educational summer that parents can afford, and they can still work and feel comfortable that their children are in a safe program," said Susan Macaluso, director of Goddard Riverside's community arts program. Price: $625 for July 1 to 12, $675 for July 15 to 26, $675 for July 29 to Aug. 9. Financial aid is available for half the campers, and there's an early bird discount of 10 percent for campers who register by Feb. 28. The Heart of Brooklyn, a partnership between institutions including the Brooklyn Public Library, Prospect Park and Brooklyn Children's Museum, offers the Brooklyn Cultural Adventures Program summer camp. Campers visit and learn from the member institutions. That might mean a morning trip to see paintings of animals at a museum, followed by an afternoon excursion to see them in real life at the Prospect Park Zoo, said communications manager Essie Lash. "It's really cool for kids who love to learn," Lash said. "It’s all about making connections across what we call our cultural campus." Kids also experience diversity at camp. "About 50 percent of campers receive tuition assistance and 50 percent do not, so they get a great socio-economic mix," Lash said. Price: Fees for 2013 haven't been posted yet. In 2012, the price was $1,250 for a nine-week session. A Park Slope institution since 1973, Camp Friendship runs a year-round afterschool program and a summer day camp for children ages 5 to 14 on Eighth Street and Sixth Avenue. Campers do sports, arts and crafts, and take trips to sites like Madame Tussauds Wax Museum, Sesame Place theme park in Langhorne, Penn., and the Staten Island Yankees. Price: Sessions run July 8 to 26 and July 29 to Aug. 16 and each cost $600 for Botanical Garden members, $675 for non-members. Campers ages 5 to 10 are welcome at three themed summer camps at the New York Botanical Garden, which debuted in 2012 to positive reviews. One has an art focus with campers drawing on nature for arts projects, another is an "adventure" camp where kids explore the gardens on hikes, and the final camp has a wetlands theme that teaches campers about marshes, ponds and rivers. Sessions at this popular camp tend to fill up fast, so register soon, warns family blog Mommy Poppins. The citywide nonprofit Good Shepherd Services runs free summer camps designed to keep youth "safe and engaged" at four sites in The Bronx: Community Center Beacon at M.S. 45; the After-School Center at P.S. 246; the After-School Center at P.S./M.S. 15 and P.S. 291; and the After-School Center at M.S. 206B. In 2011, campers at M.S. 45 topped off their summer with a Disney-themed stage performance with kids "wearing self-designed costumes, performing short dances to songs from Disney movies," including "The Lion King," "The Little Mermaid," and "Beauty and the Beast." Price: $150 for a seven-week program; dates for 2013 haven't been finalized yet. Campers at Goodwill's summer program at the Astoria Family Learning Center learn arts and crafts, take nature walks and go swimming once a week at an Olympic-sized pool on Roosevelt Island. Campers also tour local colleges and take "educationally-focused trips" to Hayden Planetarium, the Museum of Modern Art and the Museum of Natural History, according to a spokesman. I.S. 145 in Jackson Heights and at Goodwill's headquarters in the Two Coves section of Astoria. The Two Coves camp is open to all high school students in the community, but it focuses on ninth graders from families who are recent immigrants. The day camp at I.S. 141 has a dance program, including pre-professional ballet training through a partnership with In-Sight Dance Company. Sunnyside Community Services runs a free summer camp at the Beacon Community Center at I.S. 5 in East Elmhurst. "It's a tremendous opportunity," said Chaka Blackman, assistant executive director for youth and family services at Sunnyside Community Services. "It's a safe place for them to come over the summer and meet new friends, and they're around positive adults who are passionate about youth development." Dates haven't been finalized for 2013, but the program is usually seven or eight weeks and can serve about 200 kids. Each summer has a theme — last year's was the NBA — and every Friday is a competition day where teams of campers try to outdo each other. Price: Fees for 2013 haven't been posted yet, but in past years tuition has been about $300 a week, and financial aid is available. At this 42-acre site in Staten Island, campers can roam nature trails and go fishing and boating on a pond. There's also a chance to learn robotics, radio production, gardening, theater and sports. Children who live in Manhattan can take a bus from the Upper West Side to reach the camp. The YMCA runs three camps on Staten Island for different age groups: Pouch Camp for ages 5 to 13, Camp Broadway/Camp Rainbow for ages 3 to 6, and Broadway Summer Fun/South Shore Stars for ages 7 to 12. The Y also runs a swim camp and a "combo swim camp" that offers traditional camp activities like arts and crafts along with pool time. For teens ages 14 to 16, there's a counselor-in-training camp where campers learn how to be future camp leaders and "gain job readiness skills and work experience," according to the Y website. A pre-camp interview is required.